The WorryFreeMom Organizer was designed to help busy moms organize their time. Designed specifically for moms in network marketing and direct sales businesses, this planner will help you to organize your time effectively, while also giving you the ability to track your business activities. Everything is in one place! 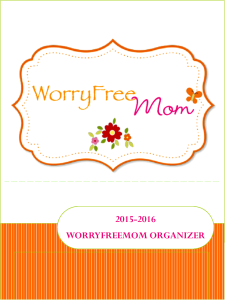 The WorryFreeMom Organizer is 224 pages, spiral bound, in full color! This year’s organizer includes: Yearly, monthly, and weekly calendars, Monthly goal setting/project planning pages, a schedule creation worksheet, weekly meal planning, Results tracking for your business, Daily & Weekly business building activity tracking, Weekly reflections to help you evaluate and improve your business building, Blank pages for notes, Budgeting pages, Homeschool lesson planning (NEW! ), and, of course, a list of Additional Resources to help you in your life & your business! Purchase the full color spiral bound copy direct from Lulu for $54.99. Use the code GETIT15 to save 15%! Would you like to print the planner yourself and put it into a 3 ring binder? Download the PDF version for just $19.95! Does your heart cry out for time to play with your family? Does day to day living seem to drown out who you are (and who you want to be!) as a wife, a mother, a woman? 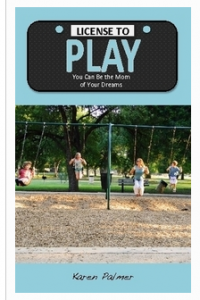 This book will help you rediscover your dreams and learn a new path to freedom–giving you a License to Play! Judy, Kristi, and Karen have created a perfect manual to teach any woman regardless of age or work experience how to build a successful network marketing business. License to Dream gives a simple, step-by-step plan for building a successful network marketing business and becoming financially free in just a few years. This book inspires readers to dream big and move forward with them on the journey to financial and lifestyle freedom. Great Books for WorryFreeMoms on Amazon.com!